Thanks to YongHeToys for posting up Images of upcoming G.I. 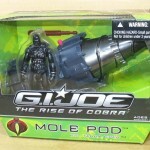 Joe Movie Rise Of Cobra Toys and Action Figures. The new Images are of the Armored Panther with Sgt. Thunderblast and Mole Pod with Terra Viper! Also of note is G.I. Joe Team Member Shipwreck!